Linda Tellier: Shop Update! "Crows"
Another Listing available today! I just added "Crows" to my etsy shop. 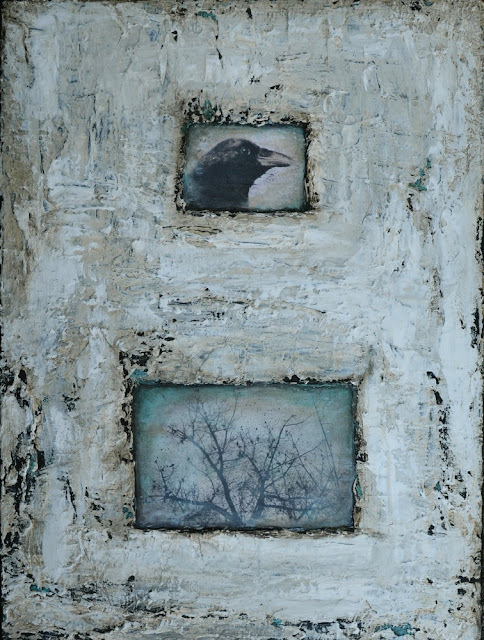 It's an 18x24x1.5 original mixed media painting, featuring one of my favorite creatures.... the crow. The top photo is from the public domain. The bottom photo is of a murder of crows in a tree, which I took . I love the way the aqua/turquoise peeks out from beneath the grungy layers in this one. For more details, click on the image, and the link will bring you to my shop. Thank you.